A work of Carla Zaccagnini with Theodor Köhler, Ayara Hernández Holz & Felix Marchand. Departing from an inquiry about the reflections on late-eighteenth-century expeditions found in the music of that time, Carla Zaccagnini decided to bring back to life Quintuor des Nègres (1809), a scene from the ballet by Johann Nepomuk Hummel based on Jacques-Henri Bernardin de Saint-Pierre’s Rousseaunian novel Paul et Virginie, of which only the piano reduction has survived. 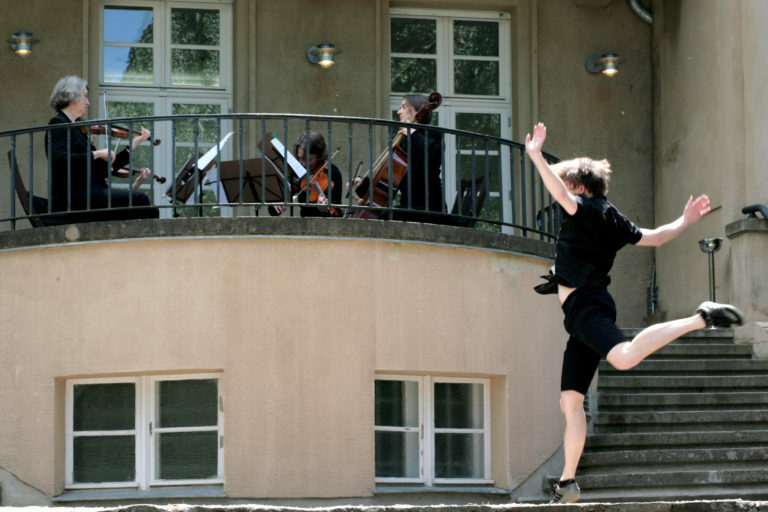 For this, Zaccagnini invited composer Theodor Köhler to adapt an instrumentation for string quartet, which is performed by the Aulos-Streichquartett Berlin on period instruments; choreographers Ayara Hernández Holz and Felix Marchand were also invited to conceive a dance piece that will be performed by Marchand in the garden of the Haus am Waldsee. Le Quintuor des Nègres, encore / Berlin Biennale 2014 from lupita pulpo on Vimeo. Copyright © 2019 Lupita Pulpo.